Arrive in beautiful, colorful, and vibrant Panama City. Built in 1519 by Pedro Arias de Avila, a Spanish conquistador who made it his base for plundering Peru’s riches, Panama today remains one of the central hubs for commerce and trade in the Americas. Panama offers diverse natural wonders, a melting pot of ethnicities and cultures, and historical as well as modern cityscapes. Your hotel is available for mid-afternoon check-in. 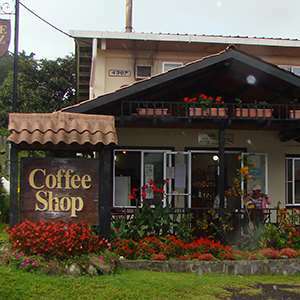 A short flight brings you to David in the province of Chiriqui. This enchanted land is the Chiriqui Highlands, the part of Cordillera Central that defines the northern border of the province of Chiriqui. It is a beautiful landscape of cloud forests, volcanic peaks, and coffee plantations, and is home to most of Panama’s Ngöbe Buglé Indians. Here you will find rainforests bedecked full of chattering iridescent birds, flowering epiphytes high above the forest floor, and gurgling streams making their way toward the nearby sea. Arrive at your resort in Boquete this afternoon. This morning, the choice is yours. Perhaps visit Finca Lerida, located just outside Baru Volcano National Park. Keep an eye out for the elusive resplendent quetzal, 3-wattled bellbird, black-faced solitaire, volcano hummingbird, long-tailed silky flycatcher, and prong-billed barbet amid the ancient trees covered with orchids, bromeliads, and lichens. Or, explore La Amistad International Park. Shared with neighboring Costa Rica, La Amistad is located on the Central American natural land bridge where flora and fauna from North and South America mix. Spend some time hiking and exploring the area in search of the resplendent quetzal, the Andean pygmy owl, and many western highland birds. Today is free to do as you please. Perhaps take an optional trip to the Caldera Hot Springs to soak in the thermally heated waters, visit Café Ruiz, where experts explain the process coffee beans go through, take an adrenaline-filled zipline tour through the cloud forest’s canopy, or enjoy a scenic horseback ride. Depart Boquete and transfer to the airport for your flight to Panama City. After breakfast, your PRIVATE CITY TOUR visits Casco Antiguo, the colonial area and oldest sector of modern Panama City, founded in 1673 and a UNESCO World Heritage Site. This historic district was built as a protected walled city after Panama City was burned down in a pirate attack in 1671. Here, see the restored colonial buildings, churches, and historical monuments. Next, visit the MIRAFLORES LOCKS at the Panama Canal to witness this engineering genius in operation. During your guided tour, learn about the history of the canal and its construction, and observe transiting vessels navigating the locks from just a few feet away. Today, a special treat is in store when you board a vessel for a Panama Canal PARTIAL TRANSIT. Your boat will enter the canal at the Gailard Cut, where the Chagres River flows into the canal and where the canal was carved through the Continental Divide. Enter the Pedro Miguel Locks, where your vessel will be lowered approximately 30 feet into Miraflores Lake. Continue to the Miraflores Locks to be lowered almost 60 feet to the Pacific Ocean. Disembark your ship and head to Gamboa Rainforest Resort within Soberania National Park. An enchanting journey takes you deep into the dense jungles of the Chagres, where the Emberá Indians have lived for centuries. The adventure begins with a RIVER CRUISE up the Chagres in dugout canoes, the Emberá traditional hand-carved boats. Upon arrival at the INDIAN VILLAGE, you will be taken back in time as you are immersed in ancient Emberá cultural dances and music that have not changed much since Columbus arrived in the 1500s. The Emberás will give you a glimpse into their mystical rituals and amazing knowledge of medicinal plants and other natural remedies. The Indians will invite you to explore the area’s abundant variety of birds and wildlife during a trek that takes you through the untouched jungle and past sparkling waterfalls. Top off your visit with a typical lunch in the village. Enjoy a free day to take advantage of the resort’s many activities, like an aerial tram tour, kayaking, fishing, or birding and monkey tours. Alternatively, simply relax by the pool or at the spa. 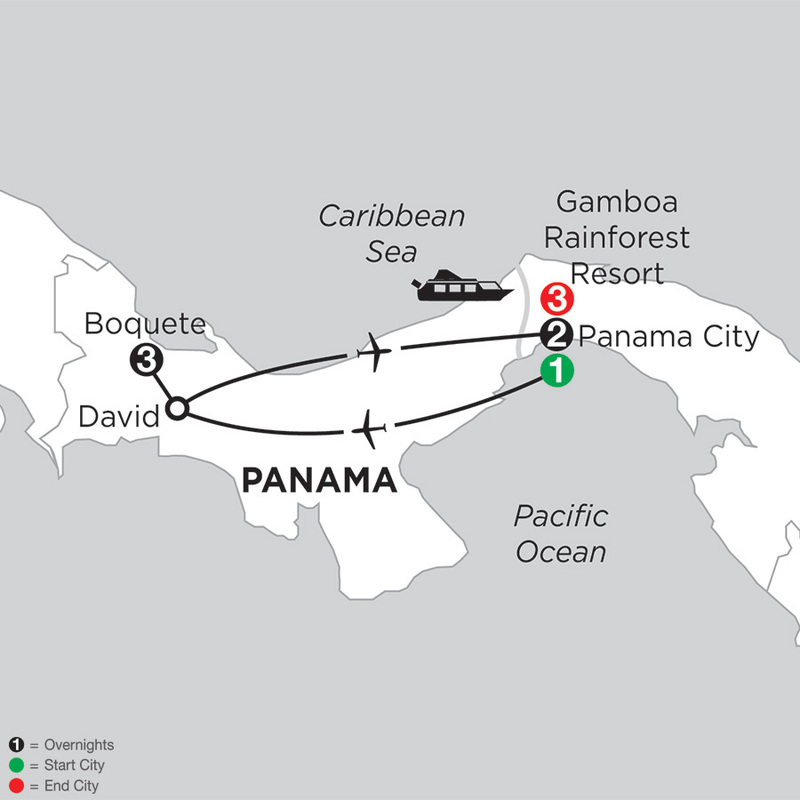 Your vacation ends with a transfer from the Gamboa Rainforest Resort to Panama City’s airport. The Crowne Plaza Hotel Panama is a full-service luxury hotel catering to the international traveler. Relax in the elegant comfort of this convenient Panama city hotel with fantastic amenities and all the comforts of home away from home. Enjoy the fine dining restaurant, with international style breakfast & lunch buffet and the Sports Bar, with a variety of national and international beverages. The Crowne Plaza Panamá has the best location in the city, located in the heart of the city and surrounded by stores, restaurants, and entertainment. Valle Escondido is a beautiful tropical lush valley just a few minutes walk from the famous resort town of Boquete in the highlands of Panama. The resort was built in 2003 and offers wonderful accommodations and amenities in a setting right out of Shangri-La. Located in Boquete and Chiriquí Province, the Valle Escondido Resort is the perfect destination for those seeking adventures including bird watching, hiking, mountain biking, rafting, and horseback riding. Cozy guestrooms are beautifully furnished with terracotta mosaic floors and dark wood furniture with varying views of the resort's grounds. Though you will be surrounded by rainforest, you will never forget you are in a resort when you spend time at the Gamboa Rainforest Resort. The large guestrooms, furnished with elegant tropical décor, boast private balconies with hammock. This modern hotel greets you with Panamanian charm and aesthetics. The Gamboa's setting in the midst of nature and its proximity to unspoiled landscapes provide ideal opportunities for all sorts of adventures. Located 30 minutes from Panama City, Gamboa Rainforest Resort is a unique property near the Soberania National Park Rainforest on the banks of the Chagres River and Panama Canal. Enjoy the exotic retreat far from the noise and bustle of the city. A contemporary landmark on Panama Bay, the InterContinental Miramar Panama epitomizes the capital's cosmopolitan style with a striking tower in the financial district. Views of the Pacific Ocean showcase vessels coming through the Panama Canal. The Intercontinental Miramar epitomizes the capital's cosmopolitan style within the financial district. Views of the Pacific Ocean showcase vessels coming through the Panama Canal, which is only five miles away. The main shopping malls and Casco Viejo (the old city) are also nearby. Visit the Caldera Hot Springs and enjoy ample time to lounge in the hot springs before a short hike to see ancient petroglyphs followed by a horseback ride through the mountainside. Since the late 1800's, three generations of the Ruiz family have been dedicated to the traditional coffee varieties and shade growing methods characteristic of excellent coffee flavor and wildlife preservation. Take a tour of Finca Ruiz and visit the plantation grounds and processing plant, followed by the facility where the coffee bags are printed and filled. 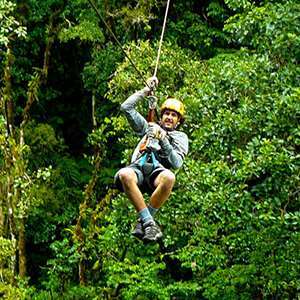 Glide on a series of zip lines through the treetops of century-old forests, high above the pristine rivers and waterfalls that make up the incredible collection of natural landscapes bordering La Amistad National Park and the famous Baru Volcano. 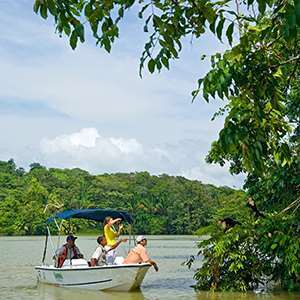 Take a boat tour through the Panama Canal into secret waterways and explore Gatun Lake with a chance to view wild monkeys in their natural habitat. 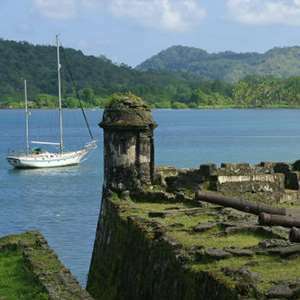 Take a guided tour of Portobelo, a sleepy bayside town full of colonial history where you will feel transported back in time. Here, you will encounter no less than 5 colonial fortifications where the canons are still pointing their mouths towards the bay they once protected. 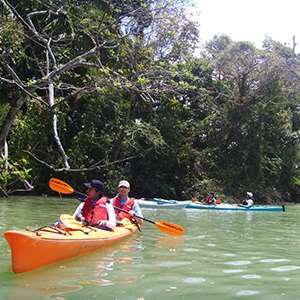 Kayak the historic Chagres River, where hundreds of "49ers" floated on their way to California during the Gold Rush. You will experience dramatic rain forest scenery and lush aquatic vegetation combined with the raucous calls of water birds as you glide silently over the water. Monograms provides travelers access to a Local Host®, so you will have someone on hand to answer those vacation questions pertaining to Panama City, Panama. No waiting in line at the concierge desk or trying to ask your waitress at breakfast directions to the shopping district. Simply ask your Local Host about Panama City and you'll be on your way in no time. Plus, your Local Host will share local Panama City insights and share suggestions for getting off the beaten path, leaving you more time to create lasting vacation memories that are yours alone. I have worked as a guide for over 8 years and my focus is on historical and ecological tours in Panama. I love guiding new people as they experience Panama for the first time. I am fluent in Spanish and English and particularly skilled at tours involving Panama’s colonial history, the Panama Canal, Miraflores, and Gatun Locks, as well as the Chagres River and Embera villages. Dazzling views of Panama City's skyline and of the Panama Canal make the Amador Causeway a scenic must. The stretch unites four small islands. It also serves a functional purpose as a breakwater to the entrance of the Canal. Swept by sea breezes, there are bike paths, restaurants, shops, a cruise port, and a yacht marina. You can glimpse the Panama Canal and ships passing under the Bridge of the Americas, once the only strip that connected North and South America. There's no better way to see Panama's past, present and future than to take a hike up Ancon Hill where you'll have a bird’s-eye view of Casco Viejo, modern Panama City and the Panama Canal. The path is lined by thriving rainforest. It’s best to explore it in the morning to avoid afternoon heat and rain showers. It takes about 2 hours to get to the top, but you can get there by taxi if you choose. Journey to the first inhabited section of Panama City, Panama Viejó, to find the ruins of the oldest capital in the Americas. Originally the site of an indigenous village, Panama Viejó was occupied by the Spanish in 1519 and was named the first city in the Americas by the King of Spain in 1521. In 1671, the city was plundered by pirates and burned to the ground. Explore the ancient ruins and take in beautiful views of Modern Panama from here. Panama’s native handicrafts rival Mexico’s and most other Latin countries in beauty and creativity. Make sure to take time to shop and bring back an item or two that can’t be mistaken for anything other than authentic Panamanian art! If you can manage to get outside the city for an afternoon, the serenity and the incomparable views at this peaceful temple are well worth a little jaunt. From the city, it looks like an egg on top of the hill, but when you get up there, you can see the impressive views of green and the wilderness of Panama, as well as views of the city out to the coast. Monograms provides travelers access to a Local Host®, so you will have someone on hand to answer those vacation questions pertaining to Boquete, Panama. No waiting in line at the concierge desk or trying to ask your waitress at breakfast directions to the shopping district. Simply ask your Local Host about Boquete and you'll be on your way in no time. Plus, your Local Host will share local Boquete insights and share suggestions for getting off the beaten path, leaving you more time to create lasting vacation memories that are yours alone. Spend your time amidst the trees across 12 platforms stretching over mountains, valleys, rivers, and all the beauty of the jungle. Boquete offers particularly impressive flora and fauna and the zip line that follows is one of the highest and longest zip lines in Central America. A great way to spend the day! An unexpected treasure in the heart of Boquete is the new library. Almost completely enclosed in glass windows, it offers a great selection of books, comfortable chairs, and fantastic art exhibits. This new building is a great source of pride for the local community and well worth a visit. If you’re up for a good hike, the Lost Waterfalls trail will take you up the mountain to view three different waterfalls. It’s a decent trek so you’ll want to make sure you’re in good shape for it but it’s absolutely worth it, and you can feel free to take the hike slowly as you’ll want to be sure to stop and take in the scenery and the wild butterflies along the way. 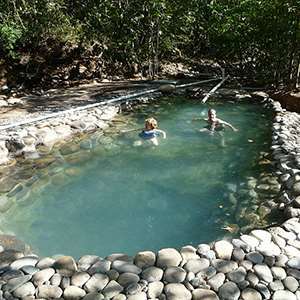 This fantastic sanctuary is an inspired project just outside of Boquete. They take in volunteers to learn about the wildlife, how to care for them, and the importance of protecting the environment here. You’ll get in some great trekking, views all the way out to the Pacific on clear days, and a wealth of education from the friendly and knowledgeable staff. This is a life-changing kind of visit if you love nature and care about protecting its precious state.